Check here for the latest site updates. On the morning of 18th December 1941, the following six aircraft and crews from 35 Squadron took part in a daylight raid against the German Battleships, Scharnhorst and Gneisenau in Brest Harbour along with five aircraft from 10 Squadron and six from 76 Squadron. Took off from Linton-on-Ouse for Brest (Scharnhorst and Gneisneau) at time stated. Attacked primary at 1236 hrs from 16,000 feet. Observer definitely saw one stick hit dock area, one astern end of ship, not necessarliy own due to close formation of Squadron. 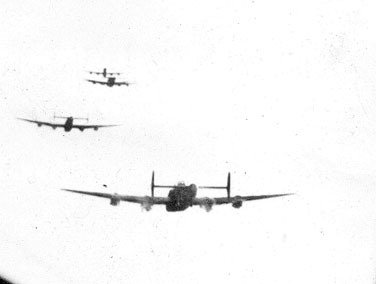 Heavy flak burst observed under port wing by other aircraft in formation. Aircraft repeatedly hit. Port inner engine failed immediately after leaving target, feathered with difficulty. Shortly afterwards starboard outer engine failed and at 1241 hrs a Glycol leak developed in the same eingine, followed by a small fire and flames were observed in the cowling. The same engine totally failed about 1250 hrs. Propellor boss holed by shrapnel. Port inner engine and port main plane behind port inner engine both holed by shrapnel. Subsequently the aircraft made a successful landing on the sea and the crew took to the dinghy, 1315 hrs, until rescued. Visibility Excellent. Sgt Greenwood 1002 1554 Took off from Linton-on-Ouse for Brest (Scharnhorst and Gneisneau) at time stated. Attacked primary at 1235 hrs from 16,000 feet. Very many bursts seen in immediate vicinity of the two cruisers. Some bursts definitely on stern of both vessels causing a whitish grey explosion. Some bombs seen to fall in water south of dock in which Gneisenau was berthed and some in quay between torpedo boat station and No.1 dry dock. None of these necessarily claimed by this aircraft. No cloud, visibility unlimited. Attacked in line astern formation. Landed safely at Linton-on-Ouse at time stated. Sgt Craig 1000 1505 Took off from Linton-on-Ouse for Brest (Scharnhorst and Gneisenau) at time stated. Attacked primary at 1238 hrs from 16,500 feet. Bursts not observed. Holed at 1239 hrs at 16,500 feet. Main plane, elevators, fins, fuselage, tail plane. 5-6/10 cloud off Lizard Point and clearing over Channel. Over target no cloud. Visibility good. Landed safely at Boscome at time stated. Sgt Crowther 1001 1441 Took off from Linton-on-Ouse for Brest (Scharnhorst and Gneisenau) at time stated. Attacked primary at 1234 hrs from 17,000 feet. Saw numerous bursts straddling docks. Holed at 1234 hrs at 17,000 feet in fuselage, bomb aimers perspex, engineers compartment, port wing. 5-6/10 cloud off Lizard Point but clearing over Channel. Over target no cloud, visibility good. Landed safely at Boscome at time stated. Sgt D S Hunt 1003 1428 Took off from Linton-on-Ouse for Brest (Scharnhorst and Gneisenau) at time stated. Attacked primary at 1238 hrs from 16,000 feet. Saw two burst on or near stern of Scharnhorst (claim). At 1238 hrs at 16,000 feet both inner engines hit over targed and stopped. Came home on two outer engines. Also holed in fuselage, windscreen, top and side. 5-6/10 cloud off Lizard Point. Clearing over Channel. Over target area no cloud. Visibility good. Landed safely at Boscome at time stated. 1004 1602 Took off from Linton-on-Ouse for Brest (Scharnhorst and Gneisenau) at time stated. Attacked primary in line astern formation at 1235 hrs at 15,500 feet. Results observed were the same as for aircraft "E". Small holes from heavy flak and the inner starboard engine became unserviceable. The weather was the same as that experienced by aircraft "E". Landed safely at Linton-on-Ouse at time stated. Halifax R9377-B "Beer" and crew taken before raid on Scharnhorst and Gneisnenau. At 0959 hrs the aircraft commenced take off and all from 35 Squadron were airborne within five minutes. They formed up in two sections and turned on a reciprocal to the take-off direction where they sighted the other Squadrons flying in formation. 35 Squadron identified itself by firing a verey cartridge and turned back heading for the aerodrome from a distance of around 8 miles west and set course from directly over the aerodrome at 1019 hrs. The five aircraft from 10 Squadron followed and the six aircraft from 76 Squadron took up the rear. The attack was to be carried out from a height of 16,000 feet with the time on target being 1238 hrs. 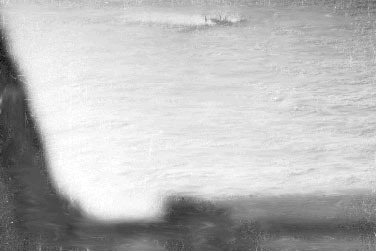 The weather en route to the target was perfect, and the formation climbed steadily to 16,500 feet between base and Lundy Island. At a point 5 to 10 miles north of Lundy Island the Halifaxes rendezvoused with formations of Stirlings and Manchesters. The Stirlings from 7 and 15 Squadrons led the way and entered the target area first and they were seen to be engaged by flak and in some cases by fighters. 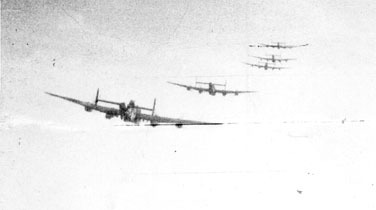 The Manchesters from 97 Squadron brought up the rear of the formation. The Halifax aircraft flew in sections of vic formation line astern and close in to each other. In perfect tight formation the Halifax aircraft ran up on an easterly heading directly at right angles to the two cruisers, Scharnhorst and Gneisenau, lying in the dry docks. Considerable and accurate flak was encountered. However, bomb aiming was carried out under ideal conditions, the leading aircraft releasing at 1236 hrs. 35 Squadron in line astern bombing run-up on Scharnhorst and Gneisenau. As the 35 Squadron Halifax aircraft were withdrawing from the target area the Manchester formations were approaching the enemy coast in close formation. 35 Squadron were prevented from reforming in formation since the leader, Wing Commander Robinson in "A" Apple, sustained several shrapnel hits after leaving the target area and was unable to feather the outer engine and lost both port engines. Squadron Leader Middleton from 35 Squadron flying Halifax "E" Edward over target area. "A" Apple and "B" Beer after leaving target area. "A" Apple leaving target area with port inner feathered. With the loss of both port engines, "A" Apple was eventually forced down in the sea some 60 miles off the English Coast. Numbers 2 and 3 remained in formation with this aircraft until it ditched in spite of airspeeds in the region of 110 mph. 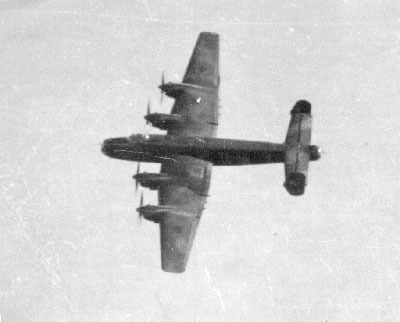 The pilots of the two accompanying Halifax aircraft from 35 Squadron, Flying Officer Wilkerson and Sergeant Williams, arranged that Flying Officer Wilkerson and his aircraft should remain circling the ditched aircraft and the crew who had by this time managed to escape from the ditched aircraft and into a dinghy. Wilkerson remained in the vicinity for half an hour communicating by wireless to the shore stations, and did not depart until he was satisfied that everything had been done to ensure the rescue of the crew in the dinghy. Halifax "A" Apple after crash landing on sea. Notice the splash of water swamps the aircraft. The crew onboard "A" Apple escaped virtually uninjured, with only the tail gunner suffering from a sprained foot. The aircraft remained afloat for forty minutes after the crash before sinking. 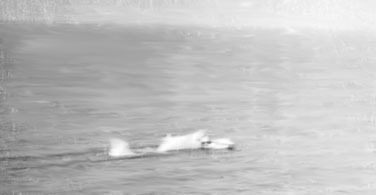 The crew were rescued within three hours of the crash by a motor launch escorted by two motor torpedo boats which had been directed to them by a passing Lysander aircraft that the crew had fired a flare at to attract attention. The remaining five Halifax aircraft and crews from 35 Squadron all managed to return safely, although they were all suffering in one way or another from having been hit by the heavy flak over the target area.